Isn’t synchronicity wonderful when it happens… Just after my last posting on how much colour enhances my life, I received a surprise present from my son. 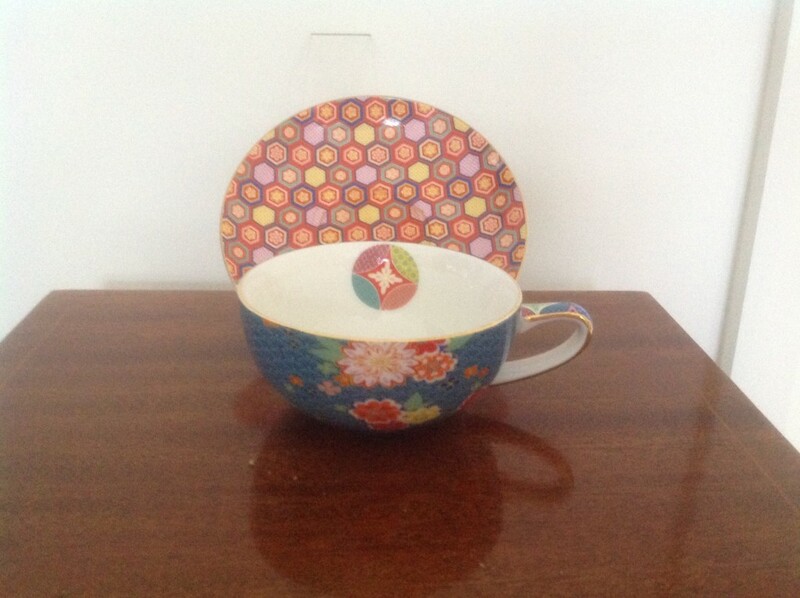 A beautiful cup and saucer in the most stunning hues, this is definitely Not going to be in the declutter box. I had what I thought was a decent clear out when I moved but still had a garage full of boxes, as time has gone by I am going through them and being ruthless. As I haven’t many shelves or units yet, what I do bring into the house must have meaning and a special significance, so Sally is right, if it doesn’t resonate good vibes, out it goes. How sneaky of your dad. It’s nice of him to think he was being considerate and doing what he thought was best – thinking you may regret your decision at a later date or thinking he’d be able to recycle the items somehow.